Activist investor Carl Icahn, who now discloses material information via Twitter, tweeted today that he and Apple CEO Tim Cook will be having dinner together in September to discuss Icahn's desire for Apple to increase its share buyback. Icahn recently purchased more than $1 billion in Apple stock and believes the company is 'extremely undervalued'. Earlier this year, Apple increased its capital return program to more than $100 billion via increased share buybacks and dividends, and issuing bonds for the first time in over a decade. You realize, I hope, that Icahn is speaking publicly like this to try to force Apple to increase the buyback. He is not a friend to Apple. Icahn has purchased a billion dollars worth of Apple stock. He wants the value of that stock to increase by some significant percentage (20%, 50%) very quickly, so he can sell it and make a buck. If things don't go his way, he'll do anything to Apple to force the issue. That's how he operates. He's not about creating long-term value or companies that are healthy over the long term. By publicly creating the hope and expectation of a bigger buyback, he increases pressure on Apple to make a bigger buyback, whether or not that's fundamentally good for the company. 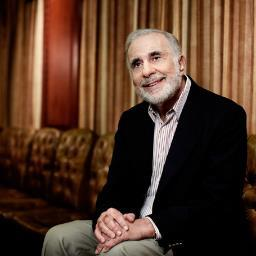 Icahn creates the possibility of shareholder discontent in the absence of an increased buyback. I guess it makes sense.. Damn. And someone paid more than $500,000 just to have a cup of coffee with him let alone dinner. I think Steve just rolled over. Exactly. There's a reason he's renowned as being controversial. There must be SEC limitations in place here. Shareholders shouldn't have manipulation ability to change stock price in a volatile sense such as this. The rest of us buy Apple stock to frame it and put it on our walls.